This professional quality omni-directional lapel (lavaliere) microphone is custom built for us by Microphone Madness. This professional level microphone comes with a 3.5mm connector that will work with most cameras and digital recorders and provides dual mono signals. 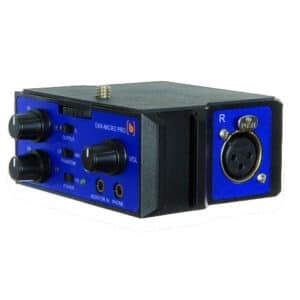 The dual mono connector provides the signal from the microphone to both channels of your stereo recording device. If your camera or recorder has as 2.5mm microphone jack, such as the Fuji cameras, you will need a 3.5mm to 2.5mm adapter. or the 2.5mm version of our Stereo Jack Adapter. Please refer to our FAQ page for a list of cameras that we believe have 2.5mm jacks. This microphone requires a bias voltage of 1.5 to 10 volts D.C. (also known as plug-in-power). This product usually ships in 3 to 5 days.